Yeah, sorry this is not a recipe today. What it is, is a rave about Light Laughing Cow Cheese. It reminds me of a cream cheese. It is a creamy wedge of low calorie cheese. I use it on sandwiches for moisture and flavor instead of mayonnaise since I cannot have my beloved Miracle Whip. It can be used with cooked veggies to give them a bit of a creamy sauce. It melts up really well. I’ve even used it instead of block cheese on an omelet for a low calorie option. Now, I must say that Trim Healthy Mama is NOT necessarily about low calories but my body is currently in a place where I need to ensure that I do not abuse calories. When I was on keto I did abuse them quite bit and thus did not lose weight after the initial losses. In order to lose weight, I have to cut back a bit and have lots of non-starchy veggies. Regular cheese can cause my weight loss to stall. To be fair, I do tend to over do it a bit (a lot) where cheese is concerned. I love cheese! Cheese makes everything better. Aldi has a version of this cheese but it has carrageenan in it so it is not as pure as Laughing Cow. Sometimes my budget requires that I use the cheaper Aldi brand though, but it is possible that it causes inflammation in my system. I’m looking into it a bit more but am concerned about it in dairy products, so better to stay with Laughing Cow. 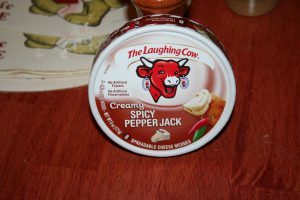 Now, most of the Laughing Cow flavors are good to use in any setting of the THM plan but I know there are a couple that have higher calories and fat, so they should not be used in the E (carbohydrate) or FP (low in both fat and carbs) meals. Stay clear of the Original Swiss but the Light Swiss is great. But the Creamy Asiago and Pepperjack flavors are also the lower calorie flavors. You are looking for the ones with 1.5 fat grams and 35 calories. I hope this helps your creamy, cheesy craving if you need to limit your dairy, if but for a season.